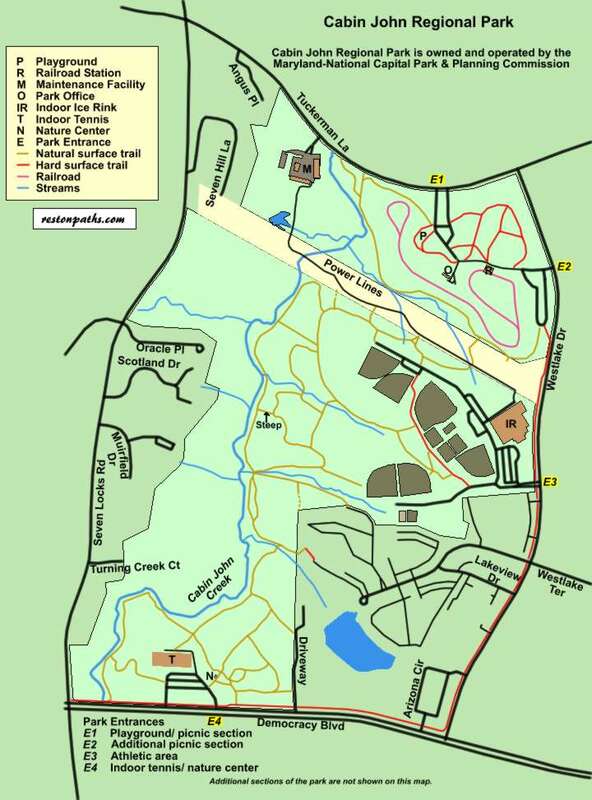 Cabin John Regional Park features a playground, picnic area, campground, athletic area, nature center, walking trails and indoor tennis facility. The portion of the park devoted to the campground is not shown on the above map. We have created directions for 2 walks as well as photo coverage of the playground area. The playground area is perhaps the finest park facility for young children in the Washington area and shows considerable imagination in the variety of equipment provided for the entertainment of children. The equipment has changed over the last 30 years but never fails to delight children and their parents. Be prepared to spend several hours here and bring food and drink because the kids are going to wear themselves out trying out the various gadgets arranged for their entertainment. The first walk circles the playground area and is only 1 mile long. It is shaded and consists primarily of natural surface trail except for the return section through the parking areas. The second walk covers the southern section of the park starting in the parking lot for the athletic area. It is 2.9 miles long and utilizes natural surface trails except for the parking areas which it crosses. Both walks cover a portion of the Cabin John Trail. The present alignment of the Cabin John Trail as of May 2005 is denoted by a widened trail marking on this map. It appears that the Cabin John Trail route changes quite often so trail markings should be consulted for the most current route. The complete Cabin John Trail extends from Goya Drive to MacArthur Boulevard. Driving directions to playground section and walk 1. Driving directions to athletic area and walk 2.